Children are the flowers of our lives. To make these flowers grow comfortably, they need adequate lighting. Experts agree that proper lighting of a children's room plays a huge role in the child's development process. The market for electrical goods is huge, especially chandeliers for children's rooms are widely represented. Lighting devices not only complement the overall appearance of the room, but also determine a certain mood of the room. In the case of children's chandeliers and room lighting, there are many requirements as a whole. This is primarily due to the need to provide a safe environment for the health of the child. Responsible parents, choosing a chandelier for a child's room, must pay attention not only to the chandelier for children, but also to the material from which it is made, its ergonomics, construction safety, as well as the presence or absence of a certificate, quality for products. What parameters do chandeliers for children have to fulfill? The quality of the material. First of all, pay attention to the practicality of the material from which the chandelier for children is made. Experts do not recommend buying a chandelier made of thin glass with many small elements in the children's room . In this respect, the chandelier should be made of safe materials. For example, plastic, metal or fabric. Today, various ecological materials appear. When it comes to plastics, they should not emit odors when the ceiling is heated. An example can be a children's chandelier with one light source made of thick glass and metal, with a merry yellow sun on a white background. Such lighting is a perfect complement to a child's room. Lighting modes. Chandelier for children's room must be able to adjust the lighting power or switching lighting modes. The child should have safe lighting not only during games, but also while reading. A children's chandelier made of the highest quality materials, i.e. plastic and metal with three light sources, perfectly illuminate the interior of the room. Merry children's motifs painted on a blue background blend in well with the interior design. Energy consumption. Chandelier models with more economical energy consumption are suitable. 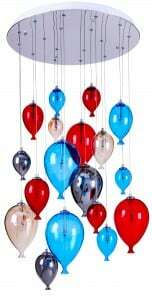 Beautiful multicolored chandelier for children in the form of balloons taking different sizes is a suitable addition to the room of toddlers. The design of the chandelier is suitable for both the boy and the girl and its low power: 20 W makes it energy-saving. Soft light. It is undesirable to use a chandelier for a children's room with sharp, contrasting light sources. It is better to prefer matt light bulbs or closed shades. A good example is a typical chandelier for a boy's room, having a form of a silver helicopter made of metal and glass that emits a delicate light enclosed in the lamp housing. For the girl, a chandelier will be suitable in the form of a yellow bee with black stripes and orange - white wings. Both fittings meet safety standards. Building. Designers recommend placing ceiling chandeliers in a children's room. They have a more reliable construction, the child does not reach with his hand, which minimizes the risk of injury. Attention should also be paid to the quality of the insulation of electrical wires. The luminaire fittings must be strong to eliminate the risk of the chandelier breaking. Design. The children's chandelier should appeal to the child. You have to make choices based on your child's tastes. A boy fond of football will be delighted with a chandelier with painted footballers and a ball, blue background and colorful costumes will be a great decoration for a children's room. However, the girl will be happy when a chandelier with animal figures such as a zebra, a giraffe, a dolphin will appear in her room. Of course, a chandelier in a children's room is not only a source of light. It is an interior element that should be harmoniously combined with the overall concept and layout of the room. When buying a children's chandelier, you can not be guided by the low price principle. It is better to buy a product from a reputable manufacturer having the certainty of purchasing a high quality chandelier with the necessary warranty and certificate. Little princesses often prefer delicate tones: pastel, pink, light blue, light green. They can be luminaires with bright, rich colors. When it comes to the appearance and style of the chandelier for children, please pay attention to what your child likes. For the girl you can match the chandelier featuring favorite cartoon characters, handles in the form of butterflies, bees and flowers. 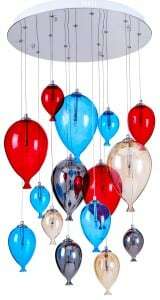 Chandeliers, ceiling lamps that resemble colorful balloons, will probably please them thanks to their unusual shapes and colors. Chandeliers for boys can also be presented in the form of children's favorite characters from fairy tales. They can be cartoon characters, funny animals, various cars, motorcycles and helicopters. The main difference between boys' chandeliers is the more saturated colors, as well as the design and material they are made of. Also, boys can like chandeliers made in the form of wooden frames with plastic elements. For boys who are interested in technology or space, metal chandeliers in the form of airplanes or a flying saucer will cause satisfaction.